Every year, Aaghaz-e-Dosti launches an Indo-Pak Peace Calendar that includes selected paintings from students from both sides of the border. The importance of this calendar is that the calendar with the paintings of an innocent and apolitical mind will remind us that mindsets have been constructed. Together with the beautiful dreams of the young and innocent, the Calendar also has messages from people who have been actively working to nurture these dreams. This calendar is a collection of shared dreams of peace and friendship. It serves as a hope shared by people who are just like us, in habit and struggle. With the turn of the pages to start a new month, the hope shall be renewed. The Calendar launch is followed by a discussion or a sharing of hopes for a peaceful and friendly co-existence. Indo-Pak Peace Calendar 2018 was the sixth calendar. We received paintings from students of several cities in India – Anupshehr (a city in Bulandshahr district of Uttar Pradesh), Cuttack, Dehradun, Delhi, Jammu and Kashmir, Kolkata, Lucknow, Mumbai, Surat and Vadodara and Pakistan – Balochistan, Karachi, Lahore, Rahim Yar Khan, Swabi and Toba Tek Singh district. The calendar was launched in Delhi and Lahore in 2018 and eminent persons participated. Indo-Pak Peace Calendar 2017 was the fifth calendar. We received paintings from students of several cities in India – Anupshehr (a city in Bulandshahr district of Uttar Pradesh), Cuttack, Dehradun, Delhi, Jammu and Kashmir, Kolkata, Lucknow, Mumbai, Surat and Vadodara and Pakistan – Balochistan, Karachi, Lahore, Rahim Yar Khan, Swabi and Toba Tek Singh district and an NRI student studying in Oman. Aaghaz-e-Dosti received messages from Dr. Salima Hashmi (Pakistani Artist, Educationalist and daughter of legendary poet Faiz Ahmed Faiz), Lt Gen (Retired) Muhammad Masood Aslam, I.A. Rahman (Recipient of Ramon Magsaysay Award for Peace and International Understanding), Khadim Hussain (Director of Baacha Khan Trust Educational Foundation, Pakistan), Sudheendra Kulkarni (Chairperson of Observer Research Foundation, Mumbai), Dr. Syeda Hameed (former member of the Planning Commission of India and a Padma Shree laureate), Colonel (Retd) Virendra Sahai Verma (Co-founder of India Pakistan Soldiers’ Initiative for Peace from India), Maj Gen (Retd) Ashok K Mehta (Former Major General of the Indian Army and Defense Analyst), Dr. Kavita A. Sharma is the President of South Asian University, Dr. Shashi Tharoor (Member of Parliament (MP) in Lok Sabha and Chairman of the Parliamentary Standing Committee on External Affairs, India), Dr. Mubashir Hassan (Former Finance Minister in the Zulfiqar Ali Bhutto Government) and Dr. Saeed Ahmed Rid (Assistant Professor, National Institute of Pakistan Studies, Quaid-i-Azam University, Pakistan). The calendar was launched in Delhi, Dehradun, Chandigarh, Kolkata, Mumbai and Surat in India and Lahore, Peshawar, Karachi and Toba Tek Singh in Pakistan and in Kyrgyz Republic. The Indo-Pak Peace Calendar – 2016 was the fourth calendar. The Calendar was designed by Shruti Achesh and Vikram Kalra. Aaghaz-e-Dosti had got a tremendous participation in paintings from youths of both the countries. From Pakistan, paintings were received from Islamabad, Karachi, Lahore and Toba Tek Singh district. From India, paintings were received from Bulandshahr (UP), Dehradun (Uttarakhand), Delhi, Jammu and Kashmir, Mumbai and Vadodara. Aaghaz-e-Dosti received messages from Ms. Asma Jahangir (Pakistani Human Rights activist), Syed Salman Chishty (Gaddinasheen-Ajmer Sharif Shrine), Mr. Ram Mohan Rai (Hali Panipati Trust India), Lalita Ramdas (Peace activist from India), Mr. Anwer Jafri (Theatre artist from Pakistan), Ms. Sadia Dehlvi (Columnist and Author from India), Dr. Ayesha Siddiqa (Political and Defense Analyst from Pakistan), Dr. Meenakshi Chhabra (Lesley University, USA), Dr. Zahid Shahab Ahmed (NUST, Pakistan), Dr. Dhananjay Tripathi (South Asian University), Dr. Farzana Bari (Human Rights Activist from Pakistan) and Mr. Nisar Ahmad Chaudhary (South Asian Fraternity – Pakistan). This calendar was launched in India on 10th January in Delhi, on 16th January in Panipat and on 30th January in Ayodhya. It was launched in Pakistan on 26th January in Toba Tek Singh, 28th January in Islamabad and in Lahore on 30th January. 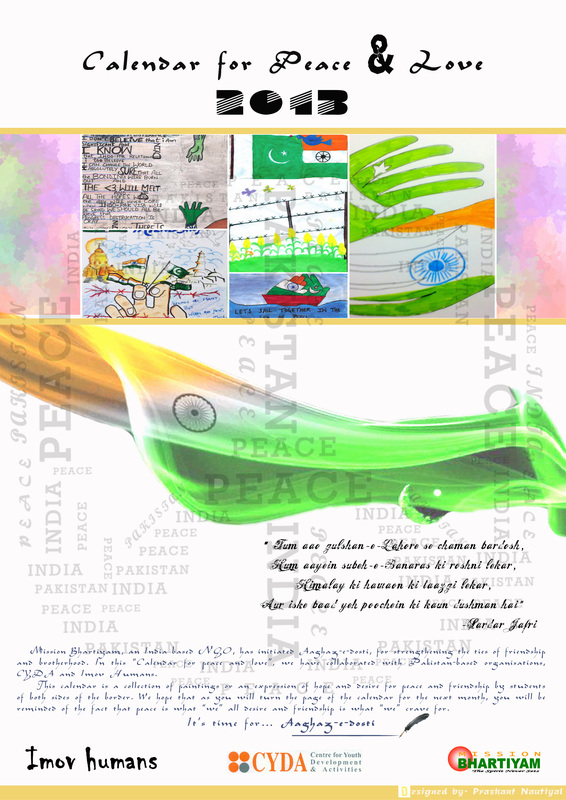 Indo-Pak Peace Calendar 2015 initiative was organized in collaboration with Indian Council for Talent Search and Competitions (ICTSC) and Yuvsatta from India and Social Awareness Media and Art Junction (SAMAAJ), South Asian Writers and Artists Network (SAWAN) and JAD Foundation from Pakistan. The Calendar was designed by Prashant Nautiyal, a core member of Mission Bhartiyam. We got a tremendous participation in our competition for paintings from youths of both the countries. From India, we received paintings from Delhi NCR, Gujarat, Uttar Pradesh, Madhya Pradesh, Maharashtra and Telangana. From Pakistan, we received paintings from Lahore, Islamabad, Rawalpindi, Chitral and Karachi. Pakistan – Tehseen Shams (National Textile Institute, Islamabad, Pakistan), Iqra Shaukat (School of International Sutdies in Sciences and Arts, Lahore, Pakistan), Alina Bibi (Govt. Degree College, Chitral, Pakistan), Priyanka Koshal (St. Anthony School, Rawalpindi, Pakistan), Mashal Amin (Hampton School, Karachi, Pakistan), and Noor-ul-wara (School of International Studies in Science and Arts, Lahore, Pakistan). 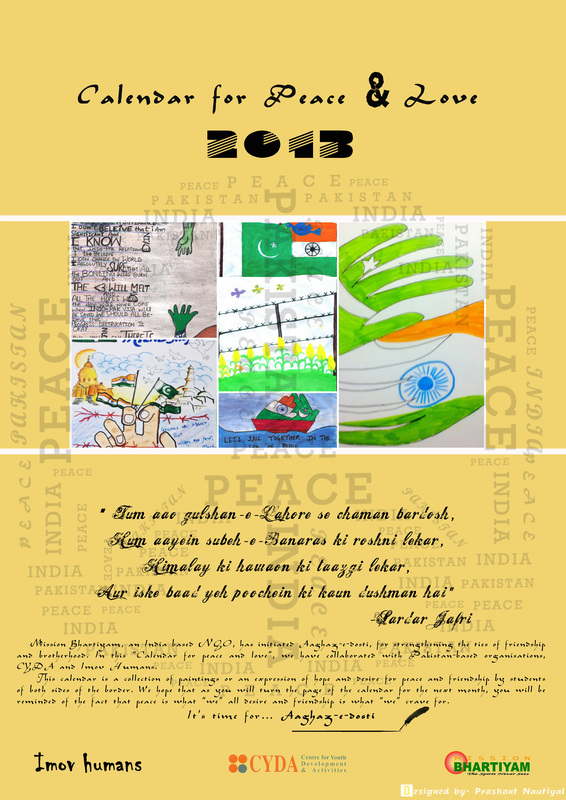 This year’s Indo-Pak Peace Calendar carried messages from well known peace activists like Tara Gandhi Bhattacharjee – grand daughter of Mahatma Gandhi, Shaila Kejriwal, Admiral Ram Das (Former Navy Chief of India), Prof. Chaman Lal (Former Professor from JNU) and Mr. Manik Samajdar from India. From Pakistan, we got messages from Dr. Pervez Hoodbhoy (Pakistani Nuclear Physicist and Adviser to UN Secretary General on Disarmament), Ms. Reema Abbasi (Author), Ms. Sheema Kermani (Theatre artist, Founder of Tehreek-e-Niswan), Dr. Ishtiaq Ahmad (Partition Scholar), Mr. B.M. Kutty and Mr. Karamat Ali (Labour and Peace Activists) and Mr. Aamir Nawaz (Theatre Director). The calendar has been launched in Delhi, Panipat, Nashik (Launch in Artillery Centre in Nashik and calendars displayed at Headquarter of All India Artillery Centre) and Chandigarh in India and Islamabad, Lahore and Karachi (Launch in a Govt. School) in Pakistan. For Indo-Pak Peace Calendar 2014, in India, Mission Bhartiyam had invited three schools – Columbia Foundation Sr. Sec. School, Indraprastha Hindu Girls’ Sr. Sec. School and Rainbow English Sr. Sec. School to participate. These schools were selected because they were also the schools that had also participated in Aaghaz-e-Dosti’s “Aman Chaupal” initiative. The motive was to assess the change, if any, brought by the Aman Chaupal initiative. In total, we had received about 70 paintings from these three schools. From these 70 paintings, Mission Bhartiyam had shortlisted 15 which were then released online for voting. In India, the entire initiative was supported by Sir Ganga Ram Hospital. In Pakistan, The Catalyst – TC and Centre for Youth Development & Activities (CYDA) had invited three schools – two from Islamabad and one from Rahim Yar Khan (near Lahore). They had also got about 80 paintings from these three schools. Out of these 80 paintings, the two organisations together had short-listed some 15 paintings which were then released online for voting. Selected Paintings: India – Shrishti (Indraprastha School, Delhi), Arti Bose (Columbia Foundation School, Delhi) and Manvi Thapar (Columbia Foundation School, Delhi). 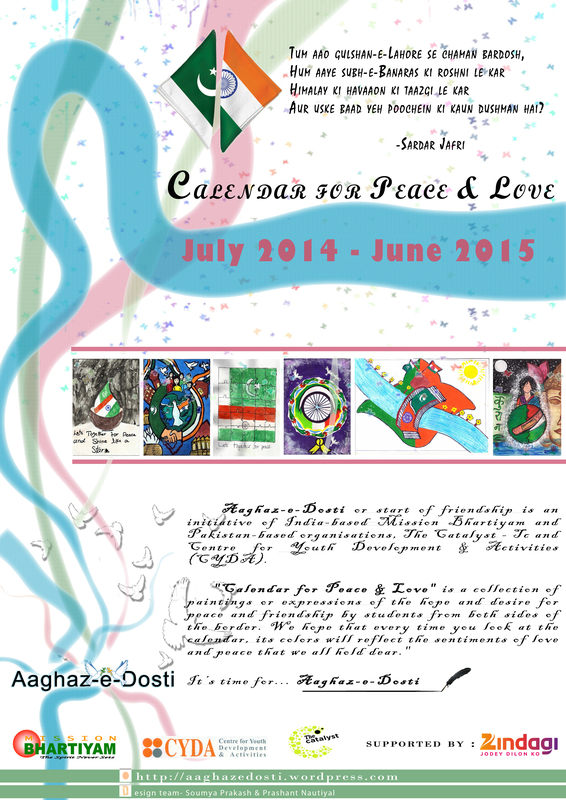 The calendar included messages from India and Pakistan invited by the people who are working for Peace. This year Aaghaz-e-Dosti included messages from Kuldip Nayar (Well-known author, columnist, human rights and peace activist), Pramod Sharma (Coordinator, Yuvsatta-an NGO empowering youth for peace) and Satyapal (Secretary General of South Asian Fraternity) from India and Raza Rumi (Director of Jinnah Institute, Senior Journalist and author), Shakeel Wahidullah Khan (President of Pakistan Chapter of BBPPF) and Kiran Nazish (Journalist) from Pakistan. Mission Bhartiyam (the organisation that initiated Aaghaz-e-Dosti in 2012) had collaborated with two Pakistan-based organisations, Center for Youth development activities (CYDA) and Imov Humans. In India, paintings were invited from schools in Delhi and Lucknow. In Pakistan, paintings were invited from 2 schools in Sadikabad and Rahim Yar Khan(Punjab province). Selected Paintings: India – Huda (Indraprastha School, Delhi), Arpit Pathak (City Montessori School, Lucknow) and Yugantika Sharma (Indraprastha School, Delhi). The calendar included message from Beena Sarwar (Editor, Aman ki Asha & documentary maker), Rahil Yasin (freelance journalist and researcher), Awais Sheikh (advocate of Sarabjit Singh case in Pakistan), Saeeda Diep (Peace activist, Chairperson of IPSS),Ram Puniyani (Peace activist), Sirish Agarwal (Founder IPFSA) and Dr Pritam Rohilla (Executive Director- Association of communal harmony in Asia) from USA. After having learnt that Ahaze Dosti People have issues 4 calenders from 2013 onward,I feel ashamed of having not issues even one after launching our conventons in both the countriess of the sub-continent.Being member of the Pak-India Peoples’forum for Peace & Democracy in both the countries on alternative years.I,along with my wife ,being members of PIPF< P&D have been able to attend joint conventions at Peshawar,Lahore ,Karachi,Delhi,Calcutta and Bangalore.I do n't know as to how it did not occur to the organisers and neither any of the members suggested to issue calenders which is a reminder through out the year.I know people had been putting forward their views that let the both governments i.e India & Pakistan relish their government but allow we people to meet each other without any restrictions.Religious exchange of peoples groups is different but People to People ,it is different..
I,whole heartily welcome the issue of calenders by Agaze-Dosti and thank whole heartily.. 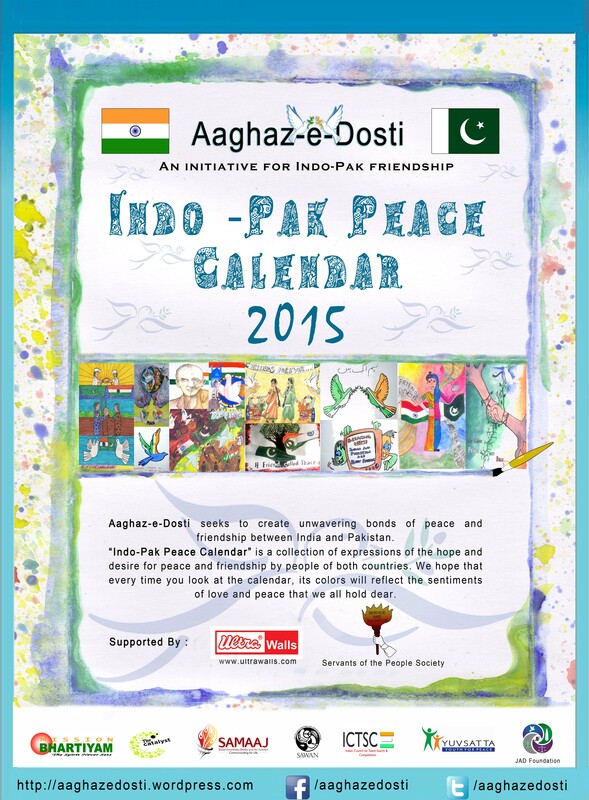 Thank You for aaghazedosti b cause u r sent me a invitation to attend a 5th INDO-PAK PEACE CALENDAR – 2017. Thank u once again.